As a recap to our 13th Annual Conference hosted in New Orleans earlier this month, Santiago Montero of Floor Covering Weekly recently covered CARE’s latest accomplishments and challenges in PET carpet recycling. Check out the interview with CARE’s Executive Director Dr. Bob Peoples below and online here. “As a scientist, my goal is to change the world and make it a better place through science and through green chemistry,” Dr. Bob Peoples told the participants of the 13th annual CARE conference held here. As executive director of CARE, the Carpet America Recovery Effort, he is doing exactly that. Achieving that mission just got a lot tougher as the low price of oil, expanding regulatory requirements and the growth of PET have all conspired to keep carpet recycling activity flat. This has resulted in pressure under a California statute (AB2398) that calls for “continuous and meaningful improvement” which has been difficult to achieve in this environment. As oil prices drop, so too does the incentive and the economic model which drives much of recycling activity. 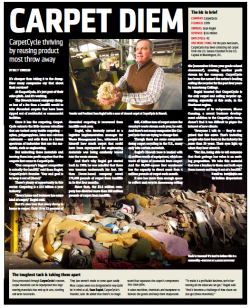 As a result, CARE, with funding from the Carpet & Rug Institute (CRI), established a Voluntary Stewardship Program that provides rebates to recyclers to encourage them to continue focusing on carpet recycling and to provide them the financial support to do so. The $4.5 million, 2-year program is designed to be a bridge and offers 2 cents a pound for every pound of recycled carpet sold and shipped, but does not cover anything that is sent to a landfill. That program is being lauded by both CARE and the CRI as a great success. 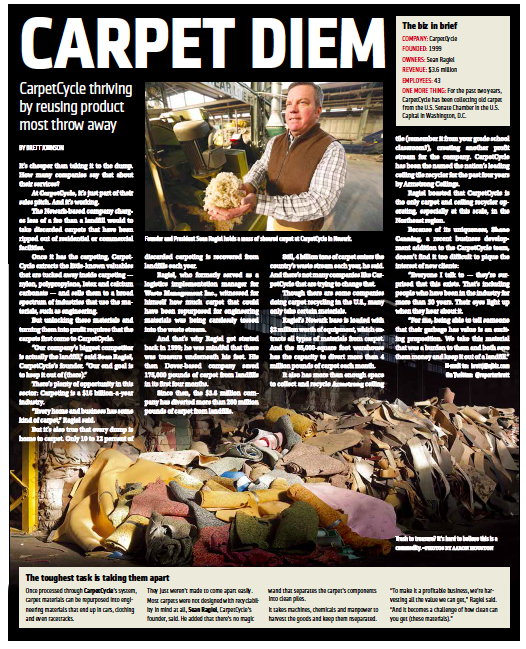 PET has made huge inroads in the carpet industry and while it is highly recyclable, no one has found a way to recycle it after it goes into carpet. That remains one of CARE’s biggest challenges. As a way of solving the problem, CARE has also funded research at the University of Connecticut to use recycled PET in other building materials products. Other notable CARE accomplishments: working with industry veteran Frank Endrenyi to help further solutions to the PET problem; the development of technologies to help differentiate between PET and PTT; a product catalog of postconsumer carpet; a recycling challenge program with Starnet members; and, a coalition of other stewardship organizations to promote recycling of mattresses, carpet, paint, batteries and thermostats. 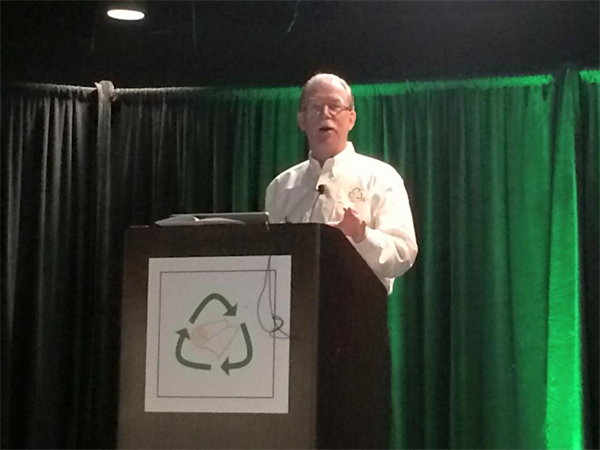 Congratulations to CARE’s 2014 Person and Recycler of the Year! 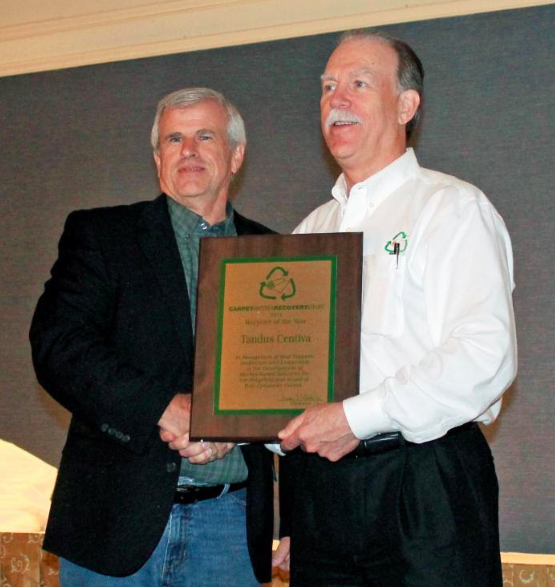 Please join us in congratulating CARE’s Person of the Year and Recycler of the Year for 2014! 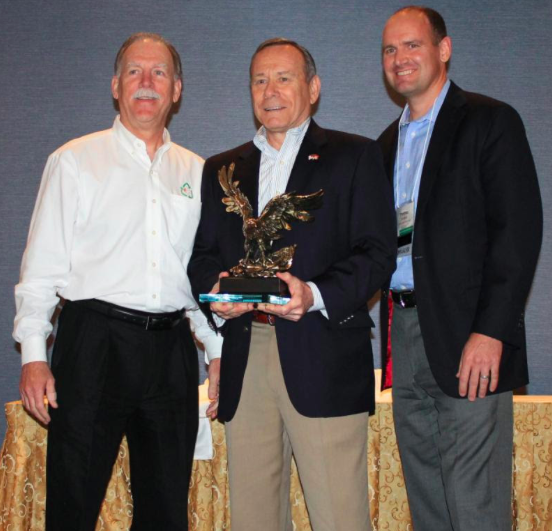 The awards were announced during our 13th Annual Conference, hosted last week in New Orleans. CARE’s 2014 Person of the Year, Fred Williamson, is a member of CARE’s board of directors and currently serves as vice president of operations for Starnet Worldwide Commercial Flooring Partnership. Williamson boasts more than 40 years of experience in the commercial flooring business, including 13 years in sales management representing carpet manufacturers, 17 years as a commercial flooring contractor, seven years with DuPont and eight years with Starnet Worldwide. Tandus Centiva, a Tarkett Company, has been named CARE’s 2014 Recycler of the Year. A CARE partner, the company employs the industry’s first closed-loop recycling program through its Dalton-based environmental center. The program, called ReStart, is designed to reclaim and recycle postconsumer flooring, installation waste, product samples and portfolios. To date, Tandus Centiva has reclaimed and recycled more than 268 million pounds of carpet, LVT and waste. Click here to download the presentation, and be sure to join us for the 2015 Annual Conference next week to hear and discuss these updates with fellow industry partners. CARE partner CarpetCycle made a special appearance in a recent issue of NJBIZ. The profile piece highlights how CarpetCycle got its start, with insight from founder and CARE Board Member Sean Ragiel. “For me, being able to tell someone that their garbage has value is an exciting proposition. We take this material that was a burden to them and both save them money and keep it out of a landfill,” says Sean.